Before it got dark, before the kids would start coming around to trick or treat, I took Kaweah for a quick walk up a local trail. There were clouds stretched across the sky in wide horizontal strokes, but enough space for the sun to light them up from below the horizon. I watched them turn yellow, then orange. “Come on, pup! Let’s get to the top of the hill!” She climbed as fast as her little old legs would take her and when we got to the clearing at the top, she got her treat. 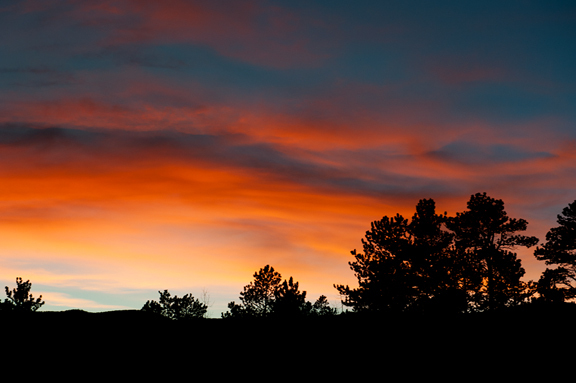 We walked back as night began to envelop the neighborhood. I gave Kaweah a stick to carry because she trots faster that way. Jeremy met us half-way down the street as he had just gotten home and had set Halloween candy out. I love fall and I love Halloween because it’s a no-pressure, festive, and fun holiday. I like it because it’s about the kid in all of us. I also like Halloween because it was Halloween night twenty years ago when Jeremy first held my hand. Technically, it was November 1, but it was a continuation of Halloween. The early years were, as my dearest Barbara would say, young love. It has since evolved into the best and strongest relationship of my life. I feel fortunate, because at 21 (or 19) you are pretty much guaranteed to make a lot of bad and dumb decisions, but I think I lucked out big time back in 1992. I still feel that way today. Happy twenty years of awesome, Jeremy! Today’s recipe is a special one, because it comes from a dear friend of mine. For our girls’ weekend we spent an evening cooking up a feast. Ellen made her world-famous Caesar salad, I contributed the gremolata smasher potatoes, and Kat made her miso butter roast chicken. Phenomenal meal all around, but the moment I tasted that chicken, the first coherent words out of my mouth were, “Kat, do you mind if I blog this recipe?” It’s just too good to not share with everyone. 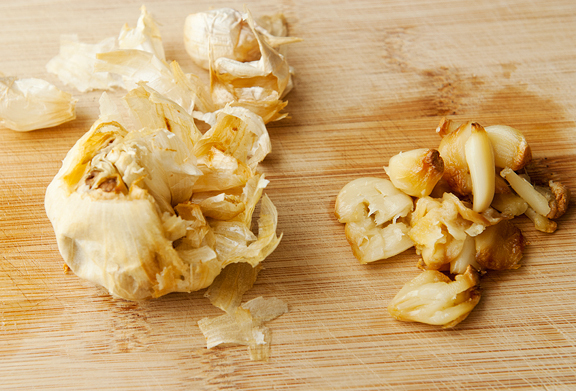 The only thing you need to do ahead of time is roast a bulb of garlic and let the butter come to room temperature. This chicken is relatively quick and easy to prepare, particularly if you roast parts rather than a whole chicken (but I give instructions for both in the recipe below). We were all fans of dark meat, so Ellen got chicken thighs. 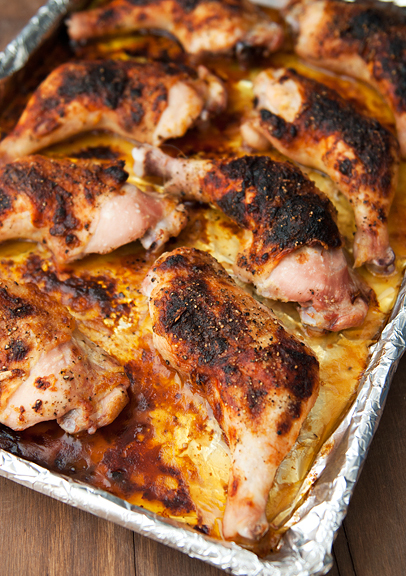 My favorite way to enjoy dark meat from a chicken is via the chicken quarter – the thigh and drumstick. Majorly fantastic in every way. The miso butter is exactly that – white miso paste beaten into unsalted butter and then there is the roasted garlic and a dash of mirin if you desire (it’s optional, really). We also tried some of the miso butter on bread and it was pretty darn good. Be sure to get some of the butter under the skin. It takes a little finesse to get the butter to stay on the chicken rather than on your hand. I generally try to shove a blob under the skin, then press the skin from above to help distribute the butter evenly. Getting a nice coat of butter on the outside is much easier. Also, if you’re thinking of omitting the skin, please don’t. That’s the best part, you know. The. Best. Part. Roast the chicken until done, which is determined by an internal temperature reading of 165°F-170°F. This should be about 30 minutes unless you are roasting a whole bird (this is discussed in the recipe below). Hopefully you will achieve a nice, crisped, golden skin on the chicken too. I can’t speak to how long it takes to roast if you are using chicken breast meat because I won’t do it. Dark meat is superior in every way. The miso isn’t a pronounced flavor, but it is definitely there lending an added dimension to the butter and garlic. Call it umami. It is delightful served with roasted potatoes (classic pairing). If you don’t find white (or yellow) miso paste in your local grocery store, try an Asian grocery store which will almost certainly carry it. 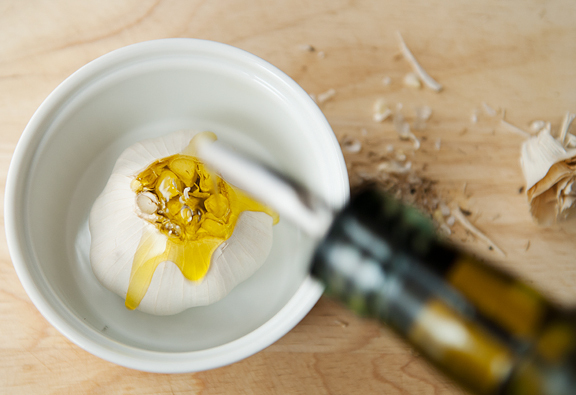 A keeper of a recipe from a good friend – a gift. 5 lbs. chicken quarters (or thighs/drumsticks) or a 5 lb. whole chicken (roaster), skin on!! Preheat oven to 400°F for chicken parts or 425°F for a whole chicken, with rack set in the middle. 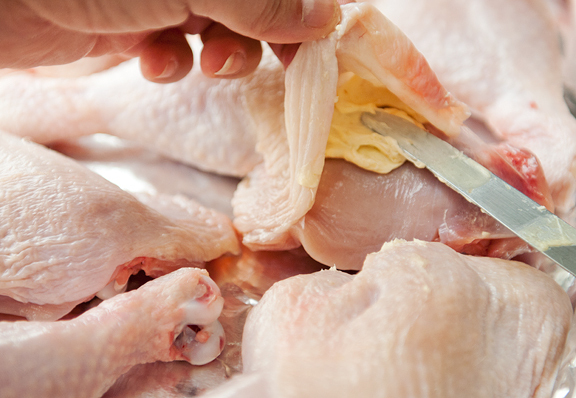 If using a whole chicken, remove the neck and giblets from the cavity. Discard or reserve for a later use. 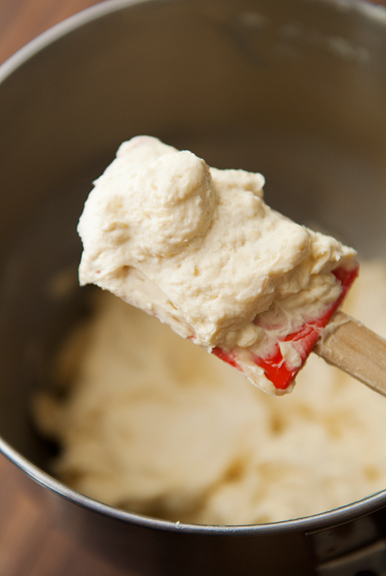 Beat the butter in a mixing bowl of a stand mixer with a paddle attachment (or you can do this by hand) until the butter is light and fluffy. Add the miso paste and beat until incorporated, scraping down the sides of the bowl if necessary. 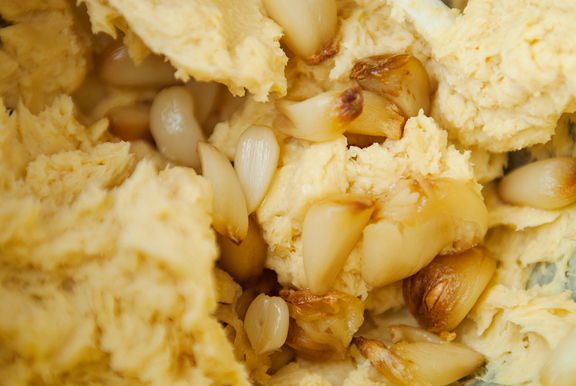 Put the roasted garlic cloves in the butter and beat until incorporated (you want the cloves to get mashed up). Add a dash of mirin – maybe a teaspoon – and mix until combined. 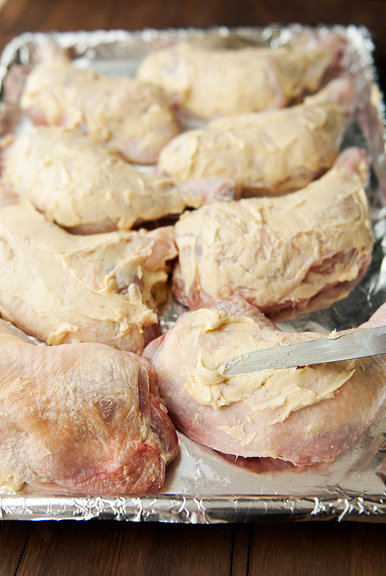 Place your fingers under the chicken skin to separate the skin from the flesh without tearing it off. The goal is to create a pocket for the miso butter. Using a knife or a spatula or your hands (hands are easiest, but also messiest) spread an even layer of miso butter under the skin. Do this for as much of the chicken as possible. 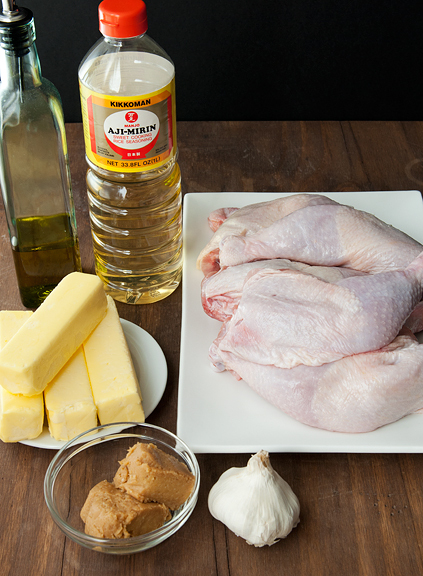 If using chicken quarters, thighs, and/or drumsticks, repeat for all pieces of chicken. When that is done, spread butter all over the outside of the chicken skin in a generous layer. 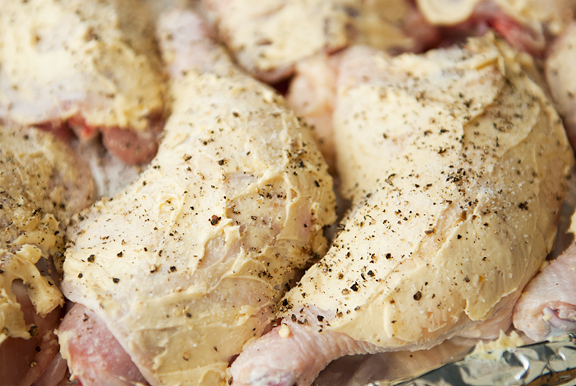 Arrange the chicken quarters, thighs and/or drumsticks on a rimmed baking sheet. I lined mine with foil for easier cleanup, but do what suits your fancy. If roasting a whole chicken, arrange on a roasting rack, breast-side up, over a roasting pan, and truss the bird. Sprinkle salt and freshly ground pepper over the chicken. Roast the parts for about 30 minutes or until a meat thermometer in the thickest part of the meat registers 165-170°F. Roast the whole bird for 40 minutes or until the breast is nicely browned. Then flip the bird (ha ha!) over and roast until a meat thermometer in the thickest part of the thigh registers 165-170°F (this takes about 20 minutes more). Remove from oven and let rest for 5 minutes. Drizzle some of the pan drippings over the chicken before serving. Serves 4-6. 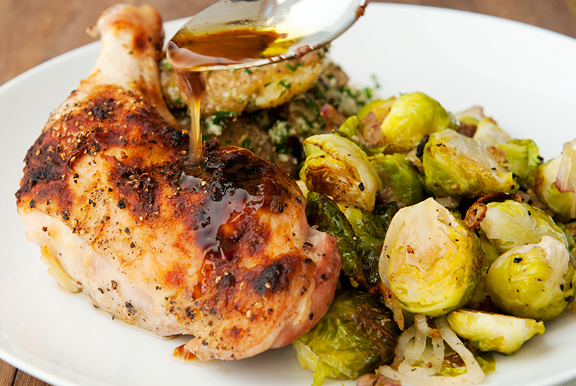 This looks totally delicious – love the idea of miso with roast chicken, yum! Delicioso, this is my kind of recipe, making this tomorrow. Lovely post, thanks for sharing. Mmmm, yum. Son and I totally agree – dark meat is WAY better than light meat. This sounds ridiculously good! Oh thank you thank you! I can’t wait to try this…my roast chicken loving daughter will be home from college for the weekend so I can make it right away!! Roasted chicken is usually just ok to me, but I think the miso & garlic will make me very happy! I just had to look at this for about a minute before I sent the link off to J with the words – “Dinner tonight, yes?” I always love finding more uses for miso since it always comes in such large containers! I love miso! Our pre-trick-or-treating meal was one of our favourite tofu recipes with miso: Steamy Kitchen’s miso tofu. Instead of putting on top of a light and summery salad, I added it to fried rice. So good! The miso-goodness gets all through the fried rice, infusing it with the tasty, salty, flavour. I can’t wait to try this roast chicken! YES! Another food to make with miso paste! I did string beans w/ miso butter a few days ago (BA recipe), and that was really good. i can’t wait to try it with chicken! Kaweah is so cute! 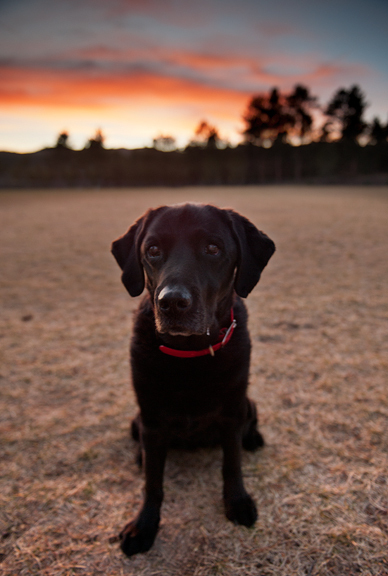 Black labs are the best dogs ever. 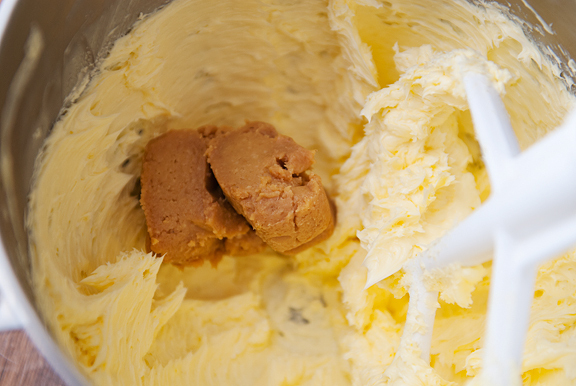 BTW, what kind/brand of butter do you usually use in your recipes? and conventional or organic? the butter in the pictures looks nice and yellow, like organic butter…I notice that organic butters tend to be more yellow than conventional? (At least the ones from stores in PA!) IN any case, I like the yellowness! I’m pulling chicken from the freezer right now so I can make this as soon as possible. I’ve been putting miso in just about everything lately and can’t wait to mix it with butter and roasted garlic. As a huge fan of roast chicken I will be giving this a try. Thanks for sharing. And happy 20th! I have all the ingredients in my fridge, and chicken in the freezer. This will be Sunday dinner!! Happy Twenty Years to you and Jeremy, and many more twenty years. Technically, you can have 3 more twenty years. Roasting a whole chicken has been a frequent fall meal in my kitchen, but even lemon/garlic/rosemary gets old. Miso paste always adds the most delicious, complex flavor. Thank you for this recipe! 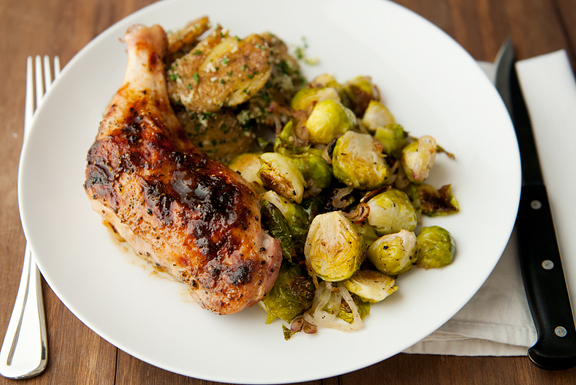 This chicken looks so darn good, I think it could be Sunday Dinner worthy! Especially with the Brussel’s sprouts! YUMMO. I totally agree about dark meat chicken! Yup! Don’t astro-physicists make THE BEST husbands? They are the sweetest kind of fella! Happy First Hand-Holding Anniversary Jen & Jeremy! whenever i see a recipe that states: “skinless, boneless chicken breasts”, i just calmly turn the page. this recipe, w/ crispy skin is how god intended us to eat the fowl. the flavor is incomparable! my wish for you & jeremy is that you continue to have the happy, contented, loving life that you’ve achieved thus far. you know that it’s not easy…you’ve got to work for what you have. much love & thanks for your blog. XXXX for kaweah. Oh, my, that looks so good. Thanks and thanks to your generous friend that let you share it with us! I’ve never cooked w/Miso, but I think I should start. Kisses to Jeremy and Kaweah. I can’t wait to try this recipe. My thanks and best wishes to Kat as well! Now this….I think I could make. Looks absolutely yummy. And again, Happy Anniversary. As a side note into our lives- we chose the day we fell in love, held hands and kissed for the first time, as our wedding date. Keeps it simple. May your love be as strong as ours. Made it last night, turned out awesome!! I coulden’t find miso paste so I used miso concentrate and I think it worked just as well! Thanks for another great recipe. Cheers! Ali – that sounds great too! Stephus – thanks, and you’re welcome! Laura – yay! Another convert!! Isn’t this an awesome recipe? I love Kathya, she’s such a great cook. Nan – I can’t vouch for all astrophysicists (have you met some of the others?? gah! ), but I think you and I probably lucked out big time! zingara – ha ha! Me too :) Awww, thank you for that. Hugs back at ya. Jill – that would have been the smart thing to do, eh? Ah well… Excuses to celebrate twice! marc – good on ya! thanks for responding! I think I will look into buying organic butter as the norm and get some CLA ! I am DEFINITELY going to make this but I think I’ll try it with a whole chicken. I made miso butter once, to use to saute hakurei turnips. I could NOT believe how amazingly delicious it was. I had to restrain myself from licking the pan. I have a tub of Korean miso paste in the fridge and I hope it works just as well! This sounds awesome! !